Mish's Global Economic Trend Analysis: Bernanke Suffers From Selective Memory Loss; Paulson Calls Bank of America "Turd in the Punchbowl"
Fed chairman Ben Bernanke's memory seems to be failing at an amazingly convenient time, for Bernanke. Please consider Bernanke Blasted in House. Federal Reserve Chairman Ben Bernanke faced open hostility from lawmakers who barraged him during a Congressional hearing over his handling of the financial crisis and the central bank's role in reshaping the banking system. Setting aside the deferential tone usually reserved for Fed chairmen, members of the House Committee on Oversight and Government Reform repeatedly interrupted Mr. Bernanke at Thursday's hearing to review the Fed's role in engineering a government aid package for Bank of America Corp. The lawmakers pored over internal Fed emails subpoenaed by the committee and projected on a screen in the hearing room. Much of the heat focused on the Fed's part in pushing Bank of America to complete its acquisition of Merrill Lynch in January. House members on both sides grilled Mr. Bernanke on whether he threatened to force out Bank of America Chief Executive Kenneth Lewis. They accused him of inconsistencies in his statements and of keeping information from other agencies. Mr. Bernanke defended the Fed's actions, saying the central bank acted with the "highest integrity" in the negotiations with Bank of America. "I did not tell Bank of America's management that the Federal Reserve would take action against the board or management," Mr. Bernanke said, adding that the decisions were "taken under highly unusual circumstances in the face of grave threats to our financial system and our economy." Pressed on the issue, Mr. Bernanke said he didn't make such a comment to Mr. Lewis and didn't remember that part of the conversation with Mr. Lacker. Rep. Dan Burton, (R., Ind. ), a former Oversight chairman, said people often used such language to avoid perjuring themselves. "Are you sure you can't remember?" The reams of documents gathered by the committee offer a rare glimpse inside the government's decision making at the height of the financial crisis. At one point, according to handwritten notes taken by an unnamed Fed official, Mr. Paulson refers to Bank of America as "the turd in the punchbowl." The notes were taken during a conference call in early January among top U.S. officials to discuss the government's rescue package. How Did a Private Deal Turn Into a Federal Bailout? Today the Committee on Oversight and Government reform released some documents investigating the question "How Did a Private Deal Turn Into a Federal Bailout?" Calculated Risk commented on this earlier in House Committee on Oversight Releases BofA Merrill Documents. Here is a snip from one the documents that Calculated Risk pointed out. Here's something we should all be hoping for: Bernanke Grilling May Weaken Case for Fed as Risk Regulator. Bernanke failed to resolve some lawmakers’ questions on whether the Fed bullied executives and stepped over other regulators in the name of financial stability in a three-hour congressional hearing yesterday. Republicans asserted the Fed interfered with commercial decisions, and Democrats said it should have wrung more concessions in return for taxpayer aid. Criticisms by members of both parties are likely to diminish support for the Obama administration’s plan to make the Fed the single agency responsible for the largest and most interconnected financial institutions. The proposal, part of a broad revamp of bank regulation, would give the Fed power to dictate standards on capital, liquidity and risk management. “It may be more important for us to find another systemic risk regulator,” Representative Paul Kanjorski, a Pennsylvania Democrat and member of the House Oversight Committee where Bernanke appeared, said in a Bloomberg Television interview after the hearing. Congress should “hesitate to put any more authority on the back of the Federal Reserve,” he said. When it comes to memory loss, there is virtually no chance that Bernanke could have forgotten a conversation with Fed Governor Lacker in which Bernanke planned to tell Bank of America that "management is gone". That is not the kind of conversation that anyone forgets, except on purpose. With that in mind "Elective Memory Loss" is a more fitting term. Selective memory loss is hard to prove. However, we do not yet fully know what's in memos and Emails circulating at the Fed. The case against Bank of America CEO Ken Lewis and former Treasury Secretary Hank Paulson is rock solid. I say go for it. Let the Criminal Indictments Begin: Paulson, Bernanke, Lewis. New York State Attorney General Andrew Cuomo's letter to the SEC and Senate Banking Committee on the Bank of America, Merrill Lynch Merger provides strong evidence of coercion to commit securities fraud by former Treasury Secretary Paulson and Fed Chairman Ben Bernanke, and actual securities fraud by Bank of America CEO Kenneth D. Lewis. Bank of America's attempt to exit the merger came to a halt on December 21, 2008. That day, Lewis informed Secretary Paulson that Bank of America still wanted to exit the merger agreement. 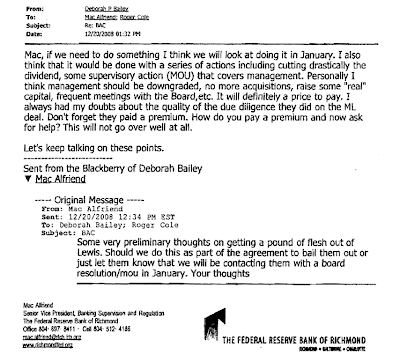 According to Lewis, Secretary Paulson then advised Lewis that, if Bank of America invoked the MAC, its management and Board would be replaced. In an interview with this Office, Secretary Paulson largely corroborated Lewis's account. On the issue of terminating management and the Board, Secretary Paulson indicated that he told Lewis that if Bank of America were to back out of the Merrill Lynch deal, the government either could or would remove the Board and management. The Fed is largely to blame for the housing/credit bubble by holding interest rates too low, too long. The way to control risk is to get rid of the Fed and its micro-mismanagement of interest rates, not to extend the Fed's power.